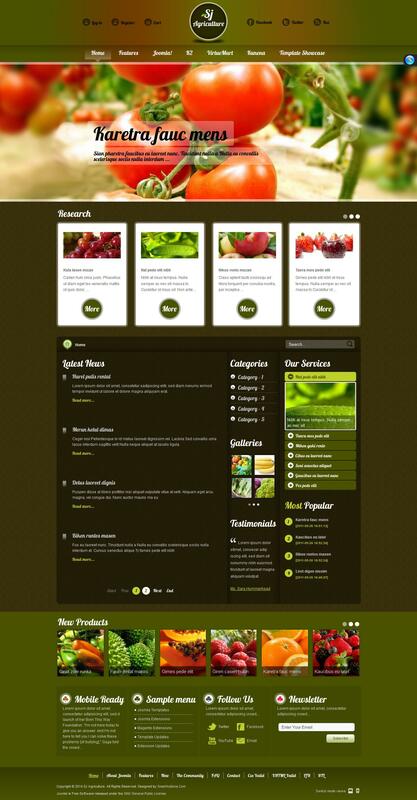 SJ Agriculture - another unbeaten template from the design studio SmartAddons, agricultural theme, with support for content management manager k2, online store VirueMart and powerful component offline Kunena. The template is based on YT Framework for Joomla 2.5, so you can easily change the color scheme, layout module placement, width template module positions, and much more. In SJ Agriculture uses professional image slideshow module SJ Content Slideshow, and a new special extension SJ Minicart Pro, for a clearer display baskets for making purchases. Also there is a full integration of several types of menus, support for Google Fonts, progressive download images as you scroll pages on the site, compatibility with mobile devices and more.